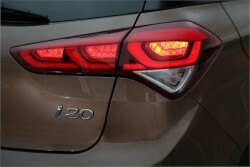 Three-cylinder power really suits Hyundai's i20 hatch. 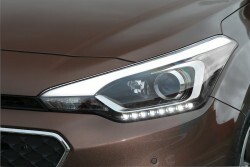 For the 2016 model year, Hyundai has added more equipment to its B-segment i20 hatchback - and the biggest introduction is a 1.0-litre turbocharged three-cylinder petrol engine, offered in two outputs. This rev-happy little lump instantly becomes the best powerplant in the i20 range, especially in more powerful 120hp guise as driven here. A Hyundai i20 five-door hatchback, which was only launched in 2015 - so we bet you're wondering what the Korean company can have done to update it already. 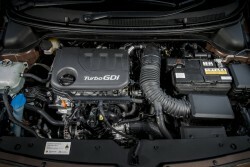 Well, the headline is the introduction of the 1.0-litre, three-cylinder turbocharged T-GDi petrol engine, which we've already seen creeping into Kia's products. 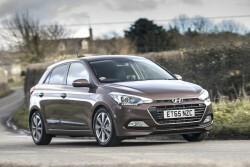 Available with either 100hp and a five-speed manual transmission, or 120hp and a six-speed gearbox (as tested here), the little triple spells the end for the underwhelming 1.4-litre, 100hp petrol unit that saw service in the i20 previously; better still, the less powerful three-pot is only £400 more expensive than the outmoded 1.4 model for model. You've barely covered 100 metres before you're smitten by the T-GDi engine. The pleasing, muted thrum it emits is charming and it is velvet smooth from the off. 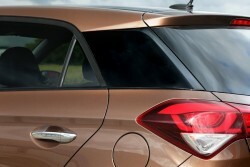 Hyundai has engineered in a huge torque plateau that stretches for 2,500rpm, so whether it's pottering about on light throttle openings or being caned up to its redline for no good reason beyond supposed road-testing thoroughness, it provides more than adequate go for the little Hyundai hatch. It stays smooth even when passing 6,000rpm, too, which is a real boon. The new petrol motor is mated to a lovely, light-of-throw gearbox with a genial action, while the body control of the i20 is remarkably good. It also rides nicely and limits the amount of wind/tyre noise getting into the passenger cabin, and a brief run on some dual carriageway showed that the i20 1.0 was more than capable of holding its own at decent speeds. It'll even execute sixth-gear overtakes on two-way A-roads with little drama, so in terms of overall refinement and performance, the T-GDi proves to be a belting little engine. Pity, then, that the i20 in general remains a slightly staid car to drive quickly - should the mood take you - with our chief bugbear of many Hyundais, that of weedy steering, letting the car down dynamically. Launching a car in the Cotswolds is clearly of logistical appeal to the manufacturers, as so many UK events take place there, but the problem with this bucolic corner of the country is that it's hardly conducive to good fuel economy. There's a lot of stopping and starting as you wend your way through chocolate box, mellow-stone conurbations, there are of course plenty of hills to keep slogging up and you're absolutely bound to get caught up behind some utterly befuddled dodderer before long. Thus, despite it being some way off the 58.9mpg quoted figure, we think 40.4mpg returned from 63 miles of driving in such conditions is actually pretty impressive stuff. Slotting the 1.0-litre T-GDi engine under the i20's snub nose hasn't changed any of the car's aesthetic or practical characteristics, so with its handsome body and a well-made interior that is, sadly, lacking some stylistic verve, it remains a strong B-segment contender that is beaten in a few departments by more established names. However, there's no doubt the new engine has ramped up the car's appeal considerably and when you factor in the five-year manufacturer's warranty, the i20's spacious cabin and its high levels of comfort, the 1.0-litre Hyundai starts to make a great deal of sense indeed.